Democratic presidential contender Howard Dean has accused Alan Greenspan of becoming too political and called for him to be replaced. Mr Dean made his outspoken remarks against the chairman of the US Federal Reserve during ongoing campaigning for the New Hampshire primary. 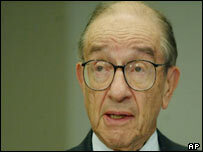 He said Greenspan lacked "courage" for not opposing President George W Bush's budget deficit and tax cuts. 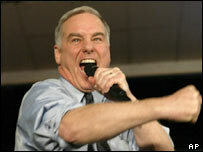 Mr Dean is hoping to perform better in New Hampshire than he did in Iowa. Before his surprisingly poor performance in the Iowa primary, Mr Dean appeared to be leading the race to become the Democratic Party's candidate to take on the president in the autumn. He now has to recover lost ground and woo the Democrat members in New Hampshire. But despite much media speculation that Mr Dean's outspoken opinions - such as opposing the Iraq war - eventually lost him the vote in Iowa, the former governor of Vermont does not appear to be toning down his comments. "I think Alan Greenspan has become too political," he said. Mr Dean added: "If he lacks the political courage to criticise the deficits, if he was foolish enough - and he is not a foolish man - to support the outrageous tax cuts that George Bush put through, then he has become too political and we need a new chairman of the Federal Reserve." The Bush tax cuts, coupled with the economic slowdown, helped create a record $374bn budget deficit in the US last year, some 3.5% of US gross domestic product. The US Government expects an even higher gap in 2004, rising to some 4.5% of GDP.